In front of the Merchandise Mart, a 60 yard long “park”. Photo by John Sacks. Judging by the vast hoards of visitors, this NeoCon was a return to the good old days. They thronged the aisles, and showrooms – and of course those notorious elevators – in numbers not seen for many years. And it remained crowded to the end. Not this year did the show start emptying out rapidly from Tuesday afternoon onwards. The hustle and bustle and crowds stayed on right through to the bitter end on Wednesday afternoon. It was as if no one wanted to give up on the excitement, or risk missing something. Why the turnaround from recent years when “Mad Monday” quickly turns into “Tedious Tuesday” and “Wearisome Wednesday”? Well, it wasn’t the launching of sparkling, exciting new products that was turning everyone on. Yes there were some, but it wasn’t as if the industry had suddenly decided to present the results of massive new investments in development and tooling. Nor was it any organizer-provided entertainment or eye-catching displays. There weren’t any this year. The cynics said it was the atrocious weather – gales, lashing rain, and even a hailstorm – which kept the visitors in the Mart, but whatever the reason, the show was a great success. A crowded Herman Miller showroom. Photo by John Sacks. It was good that the massive crowds didn’t just hog the third floor showrooms. To the delight of exhibitors on the other four floors, they also were very busy from the moment the show opened, and remained so throughout the three days. Perhaps visitors were helped to find the less obvious exhibitors by the excellent new app that launched a few weeks before the show opened. As well as providing customizable agendas and GPS-aided maps and routings around the show, this listed – and allowed you to connect with – other registered attendees. If a shortage of dramatic new products could have dampened the enthusiasm, many of the new and newly-refurbished showrooms themselves were stunning. Haworth, Herman Miller, OFS Brands, Okamura, Allermuir, Sedia Systems, and West Elm Workspace (a new partnership with Inscape) were just a few notably striking examples of generally excellent designs. Herman Miller installed over 250 feet of their Chadwick Modular Seating in the South Lobby of the Mart. Image via hermanmiller.com. One odd trend which jarred however was the way, this year, so much of the furniture was massively over-propped. It was as if some companies, especially the larger third floor ones, were trying to hide a lack of novelty in their products by covering them up with bric-a-brac. NeoCon is in theory a three-day show, starting Monday at nine and closing on Wednesday at 3:00 PM. Many of the exhibitors however are increasingly extending the event, and trying to even out the flow of visitors to more manageable levels, by starting activities earlier and earlier. Haworth’s first guests – several hundred invited dealers and architects – arrived the previous Thursday! Maybe it’s time to think about reintroducing a fourth day to the show by officially opening on the Sunday, perhaps at 11:oo AM? Height-adjustability: Bivi by Steelcase. Photo by John Sacks. 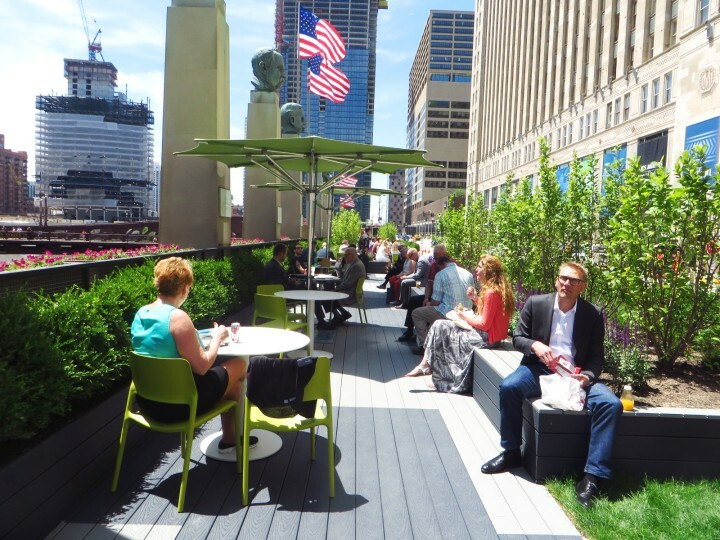 Rather than being the launch pad for dramatic new concepts, themes, or creative technologies, this year’s NeoCon concentrated on developing and refining many from last year. We knew that sit-stand would be everywhere – and it was, with a vengeance. For some like Linak of Denmark, Logicdata of Germany, and Focal, it’s all they do. For others such as Teknion, Steelcase, and Herman Miller, it’s part of a well thought through, health-related strategy with integrated workstation and seating products, and philosophies that mesh seamlessly with the rest of their offering. Some of the companies bringing up the rear just dotted one or two height adjustable tables around their stand, without the faintest idea of what they were really for. It is becoming increasingly difficult to see any differences between many of the tables for meetings and dining, and between soft seating for offices and home lounges. As with many of the most notable product ideas in the office furniture over the years, such as five-star bases on swivel chairs, monitor arms, soft-close drawers, and adjustable lumbar support, the extra cost of being able to adjust the height of a workstation is legitimized on the grounds of a healthier, and therefore more efficient, working environment. However, “Sitting is the new smoking” must be one of the most risible slogans ever coined. Soft seating, enclosures, and screens, some with acoustic properties, of all shapes and sizes and colors were everywhere. Whereas in Europe, these are generally presented as products for office breakout areas for groups or empowering individuals to work in different ways or styles, here they were generally just haphazard items shown without explanation. There were exceptions such as the way Patricia Urquiola has further developed Openest for Haworth with worksurfaces, power, and data. Openest with worksurface from Haworth. Photo by John Sacks. Another aspect of the changing work life balance could be seen in the ongoing convergence of the styles, finishes, textiles, and colors of furniture for work and at home. It is becoming increasingly difficult to see any differences between many of the tables for meetings and dining, and between soft seating for offices and home lounges. The very large Herman Miller very large showroom is frequently the first that visitors come across, and the most popular meeting point. The company featured their Living Office concept, balancing the requirements of the organisation with the needs of the people that work in them. One of the settings was Locale, described as creating a “clubhouse” setting for teams, where people can move from a collaborative group to individual work, and then on to a social activity. Herman Miller’s Locale. Photo by John Sacks. Coalesse, a member of the Steelcase group, invariably displays a series of vanguard products from named designers and the company’s design team, many of which eventually make their way into the mainstream Steelcase offering. Their large showroom included products from Lievore Altherr Molina, Jean-Marie Massaud, and Hans Wegner. The fouronefive_CO table and sixfivezero_CO stool from Coalesse. Photo by John Sacks. Other new offerings in the very crowded Haworth‘s showroom included stylish upholstery from Jasper Morrison and Jean-Marie Massaud, alongside further developed Workware technology and some attractive accessories. Desktop accessories from Haworth. Photo by John Sacks. Humanscale added technology to height-adjustability by joining up with an IT company, Tome, to create software controlled movement to their workstation. KI‘s attractive Sway lounge collection was based on a 3D orbital motion allowing users full freedom to move in all directions. The large and impressive Okamura 11th floor showroom showed a new range of Plimode task chairs as well as Muffle enclosures for individuals or small groups and the Gold Award winning Traverse table from HOK Product Design. Partita table from Koleksiyon. Photo by John Sacks. 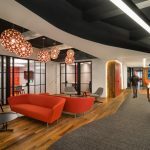 OFS Brands, Koleksiyon from Turkey, and Palmer Hamilton, who partner the UK company, Connection, all showed European styled hubs which offer high walled enclosures with acoustic properties for meetings. Neocon newcomer Koleksiyon with a large space on floor seven also showed their Partita high table. OFS Brands’s Hub. Photo by Jogb Sacks. With one of the largest showrooms on the 10th floor, Teknion were able to display elegantly their extensive collections of Italian-influenced upholstery and workstation furniture. Featured separately was Teknion Studio with their partners B&B Italia, and a display of new occasional pieces from the British design duo, PearsonLloyd. Loveseat from PearsonLloyd for Teknion. Photo by John Sacks. The Davis Furniture showroom is always a design delight; one of this year’s highlights was the Tre bar table and stools designed by Jehs+Laub. Tre bar table and stools from Davis Furniture. Photo by John Sacks. Real wood featured extensively, both in solid timber form as well as the use of natural and engineered veneers. There was no real consistency in the species chosen and we saw furniture made variously from Walnut, Rosewood, Mahogany, Tiger wood and others. The cocoon-like Brody WorkLounge from Steelcase, like similarly inspired products seen in Europe earlier this year seems to take its theme from business class airplane seats. The giveaways were few and far between this year. No leather baseballs or cardboard luggage on wheels; there were however some teddy bears which a few intrepid visitors managed to grab. Neutral Posture Guardian Chair with a bullet resistant removable vest. Photo by John Sacks. The most outlandish product spotted was Neutral Posture‘s Guardian task chair which for less than $2,000, incorporates a removable, wearable, velcro-fastened, double-sided bullet resistant vest, offering protection against a .357 Magnum.